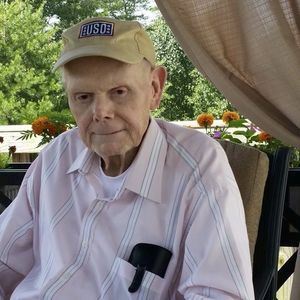 Thomas Earl "Mickie" Biddulph, Jr. passed away peacefully on August 31, 2018, in Fredericksburg, VA, with his family at his side. Born December 21, 1934, in New Brunswick, New Jersey, Mr. Biddulph was a lifelong New Jersey resident. His parents were the late Thomas Sr. and Evelyn B. (Smickenbecker) Biddulph. Mr. Biddulph graduated from St. Peter's High School in his native city, then completed a union apprenticeship program to qualify as a journeyman sheet metal worker. He helped construct or renovate buildings as diverse as Old Queens at Rutgers University; the Oyster Creek nuclear plant; and the first Atlantic City casinos. Mickie retired from the trade in 1996, but he never tired of pointing out the buildings he had helped to construct all around the State of New Jersey. He also proudly served in the US Naval Reserve from 1953-1961, following in the footsteps of his father, a WWII US Navy veteran. In his leisure time, Mr. Biddulph enjoyed RV camping, flea markets, and watching PBS & BBC programs with his late wife, Valaire (Belloff) Biddulph. Together they realized a lifelong dream to visit Europe while visiting their son John, then a naval officer. He was also predeceased by his brother William G. Biddulph and his brother-in-law and best friend, Edward V. Belloff Jr. Surviving to treasure Mr. Biddulph's memory are his children, Retired USAF Major Catherine Biddulph & her husband, Keith McClure; Dr. John Biddulph & Tracy A. (Meyer) Biddulph; David Biddulph & Joanne M. (Budrewicz) Biddulph; grandchildren, Thomas, Katerine, Matthew, Sarah, and Emily; nieces, nephews, cousins, and friends. A funeral mass will be celebrated on Saturday, September 22 at 12:00pm Noon at St. Frances Cabrini Catholic Church in Piscataway. Burial will follow at New Calvary Cemetery in Parlin, NJ. The family gratefully acknowledges the invaluable assistance of the staff and volunteers of the Palliative Care Unit and Hospice Services at Mary Washington Hospital, Fredericksburg. Memorial contributions may be made to the charity of your choice.